I rescued this yarn from a miserable failure of a knitting project. After unraveling the failure & recycling the yarn [see Bonne Marie's column in the Knitty archives for instructions] I designed Very Cherry. This midnight-snack of a sweater is a top-down shell knit in the round. Good for circular-knitting virgins, you don't need to sew any seams to finish. Instead, the knitter casts on at the upper [shoulder] edge and knits a tube, binding off at the sleeve and casting on a few underarm stitches. It's flirty and fun, styled with a waist that'll make someone very happy [or jealous]. Here's the variation of "Very Cherry" I created using the method described in my column this month. I like this sleeveless, off-the-shoulder, tightly-fitted shell shape. 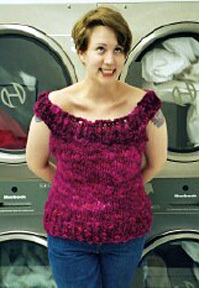 "Very Cherry" is a little fancier than everyday wear with its chi-chi yarn and long line. "Cherry Twist" wears well with jeans, and the twisted ribbing for which it's named adds interest at shoulder and waistline. The yarns carried together are heavenly soft, and the color ranges of both match up nicely for carrying the two together. Just a few skeins of each yarn are needed for this delicious attention-getter. Enjoy! CO 58[68, 74, 84, 92] sts. Join into rnd without twisting sts. Place marker at beg of rnd. Work in k1,p1 rib until piece measures 3[3.5, 3.5, 4, 4] inches. Next rnd: *BO 12[13, 14, 16, 17] sts, k 17[21, 23, 26, 29] sts* twice. 34[42, 46, 52, 58] sts left on needles in two groups. Cast on underarm stitches and mark points of shaping. Next rnd, *between the 2 sets of sts, CO 5[5, 6, 6, 7] place marker, CO 5[6, 6, 7, 7] k 17[21, 23, 26, 29] sts* twice. 54[64, 70, 78, 86] sts joined in the round. First marker marks beg of rnd. Work in St st until piece measures 3[3.5, 3.5, 4, 4] inches. Rnd 1 [dec rnd]: *k1, k2tog, k to 2 sts before next marker, k2tog, slip marker* twice. 50[60, 66, 74, 82] sts. Rnd 2-4[5, 6, 7, 7]: cont in St st.
Repeat the prev 4[5, 6, 7, 7] rnds once more - 46[56, 62, 70, 78] sts on needle. Rnd 1[inc rnd]: [k1, M1, k to next marker, M1, slip marker] twice. - 50[60, 66, 74, 82] sts. Rnd 2-5[6, 6, 7, 7]:cont in St st.
Repeat the prev 5[6, 6, 7, 7] rnds twice more - 58[68, 74, 82, 90] sts. Switch to k1p1 rib until ribbing measures 4[4.5, 4.5, 5,5] inches. 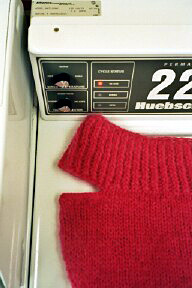 wash, press with towel until damp, pin out to measurements and allow to dry. Point 5 is 100% wool and as such readily felts. Be careful when steaming or washing. Join the new ball of yarn using the spit-splice method. *Very close-fitting garment - length will stretch & convert to width upon wearing. 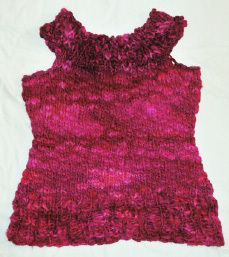 Garment shown size XL with crocheted underarm finishing. NOTE: project is made carrying both yarns together as one yarn throughout. Using 24 inch US #11/8mm circular needle and both yarns held together, CO 84[96, 106, 120, 132] sts. Join into rnd, taking care not to twist sts. Work in Twisted Rib until piece measures 4[4, 4.5, 5, 5] inches. Next rnd: *BO 18[21, 22, 24, 25] sts, k 24[27, 31, 36, 41] sts* twice. 48[54, 62, 72, 82] sts in two sections. Next rnd: *CO 6[7 ,8, 8, 9] place marker, CO 7[8, 9, 9, 10] k 24[27, 31, 36, 41]* twice. 74[84, 96, 106, 120] sts in round. The first marker placed is the new rnd marker and a shaping marker. 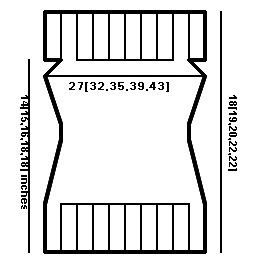 The second marker is the other shaping marker. All garment shaping happens at the side "seams", the points running down the garment body at the underarm where a non-circular garment would be sewn together. K all stitches until body measures 2.5[2.5, 3, 3.5, 3.5] inches. Dec rnd: *k1, k2tog, k to 2 sts before marker, k2tog, slip marker* twice. Rep the previous 3 rnds 1[1, 2, 2, 2] times more. Rep dec rnd 0[0, 1, 1, 1] time more. XL,XXL ONLY: work dec rnd twice more. 62[72, 80, 88, 102] sts on needle. Inc rnd: *k1, m1, k to next marker, m1, slip marker* twice. Ð 66[76, 84, 92, 106] sts. Rep prev 2 rnds 4[5, 6, 7, 7] times more. Work 2[2,0,0,0] rnds even -- 82[92, 108, 120, 134] sts. Next: Switch back to Twisted Rib until lower ribbing measures 3[3, 3.5, 4, 4] inches. Using crochet hook and WATERSPUN, work a row of single crochet along sts cast on for underarm. Turn work. Next row: *skip single crochet, slip stitch into next SC, rep from * to end of row. Repeat for other underarm edge. Using size US #6/4mm knitting needles and WATERSPUN, with right side facing pick up and knit 13[15, 17, 17, 19] sts along cast on edge at underarm. Turn. Row 1: *k2tog* across row. Blocking: pin out garment to measurements and steam lightly to even out sts. 1. To bring out the halo [fuzziness] of the mohair yarn, use a hairbrush and gently brush garment. 2. 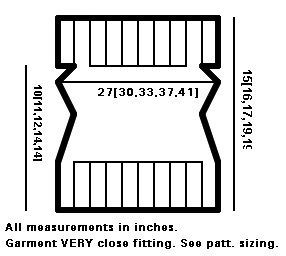 To make one chest size but a different length: Cast on for the chest size, but follow the row count directions for the length of the size that you want: Follow the shaping directions [stitch count] for your chest size, but the number of rows for the length-size. Artist/knitter/writer Jessica Fenlon Thomas lives in Pittsburgh, PA. She worked with Lily M. Chin as the Boston contributor to Lily's book, The Urban Knitter . Her artwork was featured in Interweave Knits Summer 2002 issue. She encourages visitors to Pittsburgh to patronize the Beehive coffee shop in the South Side. It's her favorite java joint - with a copy shop down the street. Pattern & images © 2003 Jessica Fenlon Thomas. Contact Jessica.